The Chrysler Group hopes that the new 2013 Dodge Dart will meet the same level of success as the Dodge Neon that left the lineup years ago and a major part of the Neon’s ongoing legend is the high performance SRT variant – a trimline that many believe will grace the new Dart in the next year. I have had the luxury of speaking with SRT brand boss Ralph Gilles about the future of the Street and Racing Technology lineup, at which point he pointed out that there are segments in which the SRT brand doesn’t current compete – at the same time mentioning that they do plan to venture into these new, popular performance segments. He didn’t go into any detail but if you look at the current SRT lineup including the upcoming 2013 Viper, there aren’t many performance segments in which SRT doesn’t currently stand on its own. SRT currently has the luxury performance sedan market covered with the Chrysler 300C SRT8, the muscle car class is covered with the Dodge Challenger SRT8 392, the performance SUV class covered (and dominated) with the Jeep Grand Cherokee SRT8, the upcoming 2013 SRT Viper should do a fine job of raising the bar for the American supercar and the incredible Dodge Charger SRT8 is really in a class of its own with no other comparable high performance muscular sedan for anywhere near the Charger SRT8s price of $47,000. Based on that lineup, the major gaps are a performance truck (which SRT has done very well in the past and Gilles hinted that it is something that is being considered) and the performance sport compact market – which has been a gaping hole since the Dodge Neon SRT4 met its demise. SRT attempted for some time to compete in the sport compact segment with the Caliber SRT4 but even with 285 horsepower, the Caliber struggled to keep up with the popular sport compacts in the class due to a variety of issues – the biggest of which was the lack of ability to make use of all of that power. However, with the new Alfa Romeo-based Dodge Dart, the SRT group has a lightweight, nimble platform that could cater perfectly to a high performance front wheel drive compact to do battle with the upcoming Ford Focus ST. The Focus ST is powered by a 2.0L EcoBoost making 246 horsepower and 250b-ft of torque, along with enhanced braking and suspension components to make for an all around performer so for the Dart SRT to keep up with the cross-town competition, it would need to at least offer comparable power…although with the Caliber SRT4 offering 285hp it would come as a huge shock if the SRT version of the new Dart didn’t at least meet the power levels of the previous models. If SRT could pack somewhere in the area of 300 horsepower into the Dart SRT4, it would not only be able to take down the Focus ST but it would also compete with some of the hottest sport compacts available in the US – such as the Subaru Impreza WRX STI. The folks at Motor Trend believe that the best choice for the new Dart SRT4 would be a beefed up version of the Dart’s current 2.0L Tigershark engine, packing more displacement and a turbocharger setup. Technically, MT gave the nod to an all aluminum, direct injection engine borrowed from the current Alfa Romeo lineup but they also pointed out that the cost would be too high – pushing it above the sticker price of the top sellers in the sport compact segment. There is also the idea of SRT shoehorning the 3.6L Pentastar V6 into the Dart which in naturally aspirated form makes 305hp in the Dodge Challenger but adding that relatively large engine to the compact Dart could put too much weight up front and negatively impact the handling of the Dart SRT. It also wouldn’t make sense to call it the Dart SRT4 if it had a V6 engine and in the past, the SRT6 name hasn’t gotten the respect that you would think. One other aspect discussed by Motor Trend is the aesthetic upgrades that would make the Dodge Dart SRT4 far more aggressive looking while also improving the aerodynamics of the high end Dart. Should an SRT Dart surface, we can fully expect a sharpened front fascia, larger wheels, lower side skirts and a rear end treatment that would include a rear spoiler and a lower splitter similar to those seen on other current SRT models. 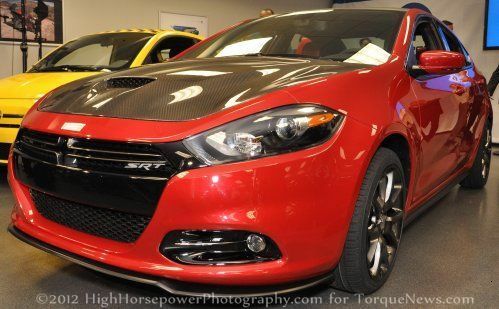 On the right is a shot of the newly debuted Dodge Dart GTS 210 Tribute with an SRT badge crudely mocked up into the grille. The GTS 210 Tribute is a great looking modified version of the Dart and this could be a precursor to what is coming in the way of an SRT version of the Dart. My father was a designer at Chrysler and would be proud of what they have accomplished today especially at the SRT team. The dream out there for this car is to use the 300 horsepower 8 speed automatic and set the bar high. This would be superior technology to the new Lexus at half the price. Unfortunately the word on the street is that this 300 hp 8 speed would place the price over $30K and the SRT team desires to keep the Dart SRT under $30K. My opinion is screw the under $30K goal and shoot for the moon! I would buy one as would many others.